I am an accountant by trade and I will admit that I like a good deal. I will buy things on sale, I will try to stretch a dollar. However, an offer came in the mail last week that I can definitely pass on. It was not a good deal on a car. It was not a bargain on clothes. It was not a coupon for a restaurant. It was an offer to buy two cemetery plots for $995! Yes, a buy one get one free eternal resting place. I was mildly upset the first time I received a senior discount at McDonald’s. I have tossed many mailings that come from AARP. I get the mailings about retirement communities and think to myself, “that is a long way off.” But a solicitation for grace spaces? First of all, I don’t really see that this is an expense that I will enjoy the use of it. The offer states clearly at the top that this is “back by popular demand.” Is this demand from satisfied customers? Is the demand driven by referrals? 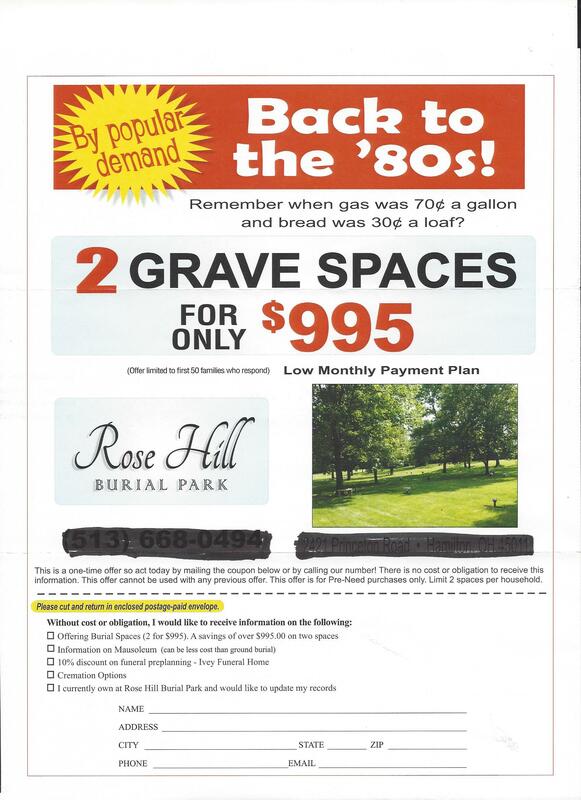 The letter also states that the offer is for “Pre-Need purchases only” – if you have a preexisting need for a cemetery plot, sorry you are out of luck! However, I do have a tent in the garage. I could make my purchase and use it as a camping spot. I bet it is quiet, especially at night. This entry was posted in Humor on May 16, 2017 by Leonard. Leonard, this is so hilarious! I am right there with you! Another good one, keep em coming!